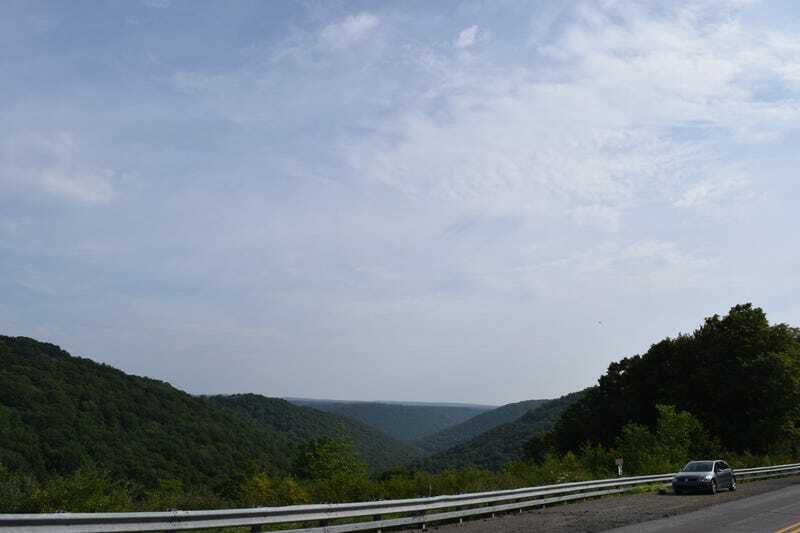 Spent the last 3 days driving around the north(ish) part of PA. Visited 3 state parks and did some hiking/camping. Total trip was around 700 miles. 500 of which was mountainous windy roads. TDI performed admirably, never dropping below 50mpg. Leonard Harrison State Park: Home of the “Grand Canyon of PA”. It’s beautiful, but comparing it to the Grand Canyon is a bit of a stretch. Played around with shutter speeds to get different effects with the waterfalls that were at the bottom. Kinzua Bridge State Park: This place is awesome. A tornado took out this train bridge in 2003. Although they discourage it, there is nothing to stop you from climbing down to the wreckage. There’s even a path that leads you to it. If you look closely at this last one, you can spot two women who were braver than I.
Cherry Springs State Park: A certified dark sky location. I’ve been meaning to come out here for awhile, and now that I have a decent camera I thought I’d make the trip. I went during a full moon as a reconnaissance run, figuring it wouldn’t be as crowded, plus I like taking photos of the moon. I was right on the not being crowded part, but weather didn’t cooperate. Still got a few neat pics. There was a sight fog all night so none of my moon shots came out well. I’ll be picking this guy up tomorrow, and will be visiting Cherry Springs again when there is a new moon in September. Any photography/oppo members want to meet up let me know. Beautiful scenery and even better roads.